Preheat a skillet over medium heat. Apply nonstick spray. Combine all ingredients in a large bowl with a mixer set on high speed. Mix until smooth. 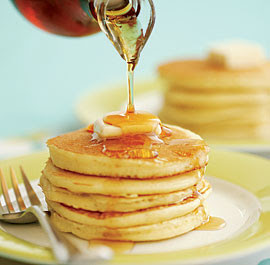 Pour the batter by 1/3-cup portions into the hot pan and cook pancakes for 1-2 minutes per side or until brown. Repeat with remaining batter.